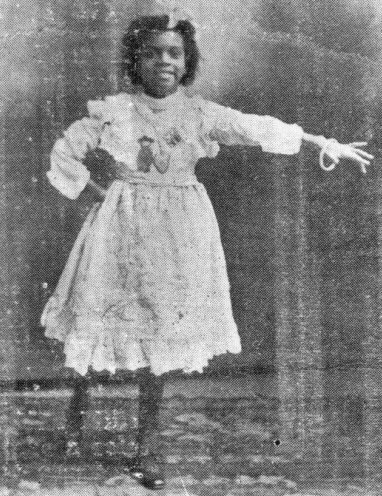 Florence Mills was a champion dancer at age 5. The picture above shows her wearing (pinned to her chest) medals for Cakewalking and Buck Dancing. The bracelet she is holding out was presented to her by the wife of the British ambassador for entertaining the diplomatic set. When asked to remove it for the photo, she said "No bracelet, no picture." She was skilled in all varieties of jazz and tap dance and was especially renowned for her 'acrobatic' and 'eccentric' dancing. Some of the latter she would have learned from her husband U.S. 'Slow Kid' Thompson, the originator of 'slow motion dancing' and one of the earliest practitioners of Russian dancing or 'legomania'. Her lessons in tap came from her close personal friend Bill 'Bojangles' Robinson, when she was living in Chicago in 1916-17. "I never know what I'm going to do. Perhaps I'm the black Eva Tanguay: I don't know. And I don't care. I just go crazy when the music starts and I like to give the audience all it craves. I make up the dances to the songs beforehand, but then something happens, like one of the orchestra talking to me, and I answer back and watch the audience without appearing to do so. It's great fun. Something different at every performance. It keeps me fresh. Once in New York I fell down, literally. Did the split. The audience thought I was hurt. I heard some sympathetic expressions. So I got up and started to limp comically. It got a burst of applause. Then I winked and that got another hand. So the producer ran back stage and asked me to keep it in. I did for several nights but other things happened and I forgot. I never remember just what to do. I'm the despair of stage managers who want a player to act in a groove. No groove for me. The stage isn't large enough for me at times. But it is during the midnight performances that I let out the most. We all do. Not that we overstep the conventions, you understand. But it's just the feeling that it's after hours, I suppose. And we whoop it up." Noble Sissle's description of Florence's dancing was, "She was Dresden china and she turned into a stick of dynamite." "It was the unexpected and final entrance from the organ down the steps into the arena of Florence Mills, Johnny Hudgins, and the Blackbirds which sent the house wild with enthusiasm. Johnny Hudgins was encored and encored until it seemed as if his marvellously unattached limbs would fall off. One would have thought nobody could follow him. But the thunder increased as the slim body of Florence Mills went through more amusing contortions than you could imagine in a nightmare." Some of the highest enthusiasm for Florence's dancing came from the experts of classical dance and ballet. They understood that her jazz dancing was art of the highest form. Arnold Haskell (famous ballet critic): "She was an exceedingly great artist . . . I would put the late Florence Mills, as a dancer, on a par with any of the admittedly great artists of the dance. She had much to express, and the power and the means technically to express it." "It is notable how much the show attracts other dancers. Anton Dolin has not missed a Tuesday matinee since the start and Massine, who saw it for the first time last week said 'After this all other dancing is futile. Never before have I seen creative artists able to achieve all they imagined'". When choreographer Buddy Bradley told ballerina Alicia Markova that she reminded him of Florence Mills, she was puzzled because she had never heard of Florence. Famous ballet composer Frederick Ashton re-assured her, "You couldn't wish for a greater compliment."